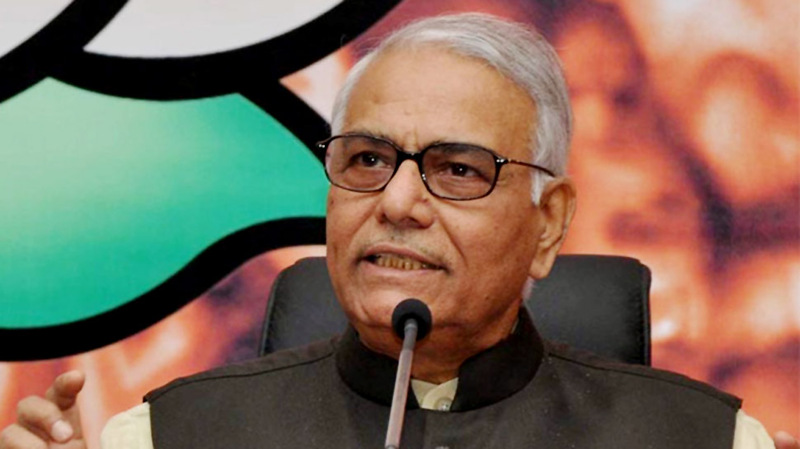 New Delhi, April 17 (newsin.asia): Yashwant Sinha, a Bharatiya Janata Party (BJP) member and former Finance an Foreign Minister, has appealed to party MPs to speak up against the disastrous policies of the Narendra Modi government and the style of functioning of Prime Minister Modi, to save the party and the country from going further downhill. In an open letter to the MPs, who have an overwhelming majority in the Indian parliament , Sinha said: “ We all worked very hard for the victory of the party in the 2014 Lok Sabha elections. Some of us had been struggling against the rule of the UPA government, in Parliament and outside, ever since it assumed office in 2004 while some others were enjoying the fruits of office in their respective states. We were delighted with the results of the 2014 elections and expected that the unprecedented victory would mark the beginning of a new and glorious chapter in our country’s history. We backed the Prime Minister and his team to the hilt, and in full faith. The government has now completed nearly four years in office, presented five budgets and used up all the opportunity available to it to show results. At the end of it, however, we seem to have lost our way and the confidence of the voters. The economic situation is grim, despite tall claims to the contrary by the government that we are the world’s fastest growing economy. A fast growing economy does not accumulate the kind of non-performing assets in its banks, as we have done over the last four years. In a fast growing economy the farmers are not in distress, the youth are not without jobs, small businesses do not stand destroyed and savings and investment do not fall as drastically as they have done over the last four years. What is worse, corruption has raised its ugly head again and banking scams are tumbling out of the closet one after another. The scamsters also manage to run away from the country somehow, as the government watches helplessly. Women are more unsafe today than ever before. Rapes have become the order of the day and instead of acting strictly against the rapists we have become their apologists. In many cases, our own people are involved in these heinous crimes. The minorities are alienated. The worst is that the Scheduled Castes and Tribes, the weaker sections of our society, have been exposed to atrocities and inequities as never before and the guarantees given to them in the Constitution stand threatened. The sum total of our foreign policy seems to consist of frequent foreign visits by the Prime Minister and his hugging foreign dignitaries, whether they like it or not. It is completely devoid of substance and has failed miserably even in our immediate neighbourhood, where China is trampling all over our interests. The smartly executed surgical strike by our brave jawans against Pakistan has been wasted and Pakistan continues to export terror to India unabated as we watch helplessly. Jammu and Kashmir continues to burn, Left wing extremism refuses to be tamed, and the common man is suffering as never before. Internal democracy in the party stands completely destroyed. Friends tell me that even in parliamentary party meetings, MPs do not get an opportunity, as in the past, to air their views. In the other party meetings, also, the communication is always one-way. They speak and you listen. The Prime Minister has no time for you. The party headquarters has become a corporate office where it is impossible to meet the CEO. The most important threat that has emerged over the last four years, however, is to our democracy. Institutions of democracy have been demeaned and denigrated. Parliament has been reduced to the level of a joke. The Prime Minister did not even once sit down with senior leaders of the Opposition parties in Parliament when the just-concluded Budget Session was being disrupted in order to find a way out. Then he fasted to shift the blame to others. The first part of the most important Budget Session was the shortest ever. I compare this to the days of Atal Bihari Vajpayee when all of us were under strict instructions to accommodate the Opposition and ensure that Parliament functioned. So we had adjournment motions, no-confidence motions and other discussions under any rule the Opposition wanted. The press conference by four senior-most judges of the Supreme Court was unprecedented in the annals of our democratic history. It brought out clearly the rot that has been allowed to afflict the highest judicial institution of our country. The judges have repeatedly pointed out that democracy in our country is under threat. Today, it appears as if winning elections by controlling the means of communication, specially the media and social media, is the sole purpose of our party and even that is threatened seriously now. I do not know how many of you will get the ticket for the next Lok Sabha elections but if previous experience is any guide, half of you at least will not. The chances of your winning the election, even if you get the ticket are fairly remote. In the last Lok Sabha election the BJP had secured only 31 per cent votes; 69 per cent was polled against it. So, if the opposition unites, you will be nowhere. The situation demands that you speak up in the national interest. I am glad to note that at least five Scheduled Caste MPs of the party have expressed their disenchantment with the government for not delivering on the promises made to the community. I am urging you to also express your opinion frankly before the bosses on all issues confronting us. If you remain silent now you will do a great disservice to the country. Future generations are unlikely to forgive you. It is your right to demand accountability from those who are in government today and are letting down the country. The interest of the country supersedes that of the party, just as the interest of the party supersedes the interest of an individual. I am appealing specially to Advaniji and Joshiji to take a stand in the national interest and ensure that the values they have made such unparalleled sacrifices to uphold are protected and preserved for future generations and corrective steps are taken in time. There have been some minor successes no doubt, but the big failures overshadow them completely. I hope you will give serious consideration to the issues I have raised in this letter.